Last week, the Government kicked off a conversation about the future of work. But they'd do well to forget about robots and remote working. Look, instead, to what tech companies in Ireland are doing now. Because what you see in Google, Facebook and WeWork today is what you'll see in ordinary office blocks in five years time. Some of it is a marked improvement and some of it is an invasion of privacy. But it's all likely to happen. Let's start with the good stuff that tech workplaces bring us. 1 - Free food as standard: It never fails to amaze me how traditional companies don't get this. Walk through a modern tech company's office and you'll see free fruit, drinks and snacks for anyone who wants it. It's now a basic perk that keeps staff more engaged and content. It's clearly worth more than the few euro it costs to put it there. What is the hangup that ordinary firms have around this? Why isn't free fruit and bottled water, at a minimum, standard on every floor of every office? Do managers really believe that staff will smuggle bags of it out to sell on the market? Every time I walk through one of the big tech companies with a group of 'old media' colleagues, someone will look around goggle-eyed at the free food that's on offer. It's a depressing reminder of the early days of Ireland's membership of the European Union, when newly-elected Irish MEPs would ask ushers in Strasbourg whether they were 'allowed keep the pens'. But offices with crap coffee and half-empty vending machines that are limited to Catch Bars and Walkers Crisps will make it easy for young, in-demand professionals to accept offers from better-equipped rivals. 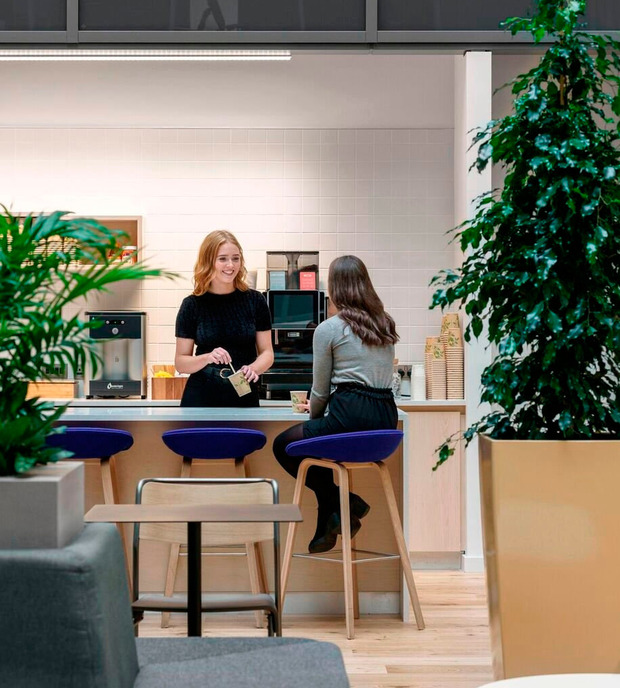 2 - Nicer physical offices: Last week, WeWork announced a big expansion in Ireland: a sixth building, its biggest yet. This puts the American chain's investment in Ireland on par with - or ahead of - any other city in the world outside the US. Why is Dublin such an opportunity for WeWork? Two reasons. First, it's a genuine tech hub with startups and growing firms that like WeWork's tone. But the obvious other reason is that conventional Irish offices are dull, boring places that people are desperately looking for alternatives to. Thought your bland, glass office block in a business park was the schizz? Think again. Why would creative, productive professionals want to work in something that looks like it was plucked out of Delaware in 1995? "The Iveagh Court is completely full," said WeWork's UK and Ireland boss Leni Zneimer. "We're seeing incredible uptake here. There isn't a cap in sight. We're just getting started." Why is WeWork taking off? Because it creates much more attractive work environments for people under 40 than existing office blocks. And it's redolent of the environments that companies like Google and Facebook - and dozens of copycats - have created in Dublin. That means lots of natural light. It means couches where you can work with your laptop instead of sitting in a line of desks like you're at school. It basically means an environment that doesn't look like it was modelled on an insurance office in Slough, or a call centre in Fermoy. 3 - Cities, or the feel of a city: Why do tech companies now overwhelmingly choose city centre locations as office bases and not suburbs or regional towns? Because that's where the most talented young people want to be. And you can forget about your preconceived notions of 'good areas' and 'bad areas' of Irish cities. The evidence overwhelmingly shows that tech firms would rather rejuvenate an old building in a rundown area that is central in the city rather than place it 12 miles away. If you're over 40 and much prefer driving to your business park office from your suburban semi-detached house with a large garden, fine. But that's a million miles from where the idealised work environment is pointing to right now. Workers now have the choice of being somewhere they can walk or cycle to, with a choice of restaurants, shops and other places to hang out. But overall, metropolitanism is very much in the ascendant: out-of-city business parks have a tough job selling themselves in the near future. But that's nothing compared to what's coming. I recently stopped in to see a friend in Bloomberg's swanky new office in London. It has decided that a signature and email address isn't enough: it needs your photo. So you stand there while a camera snaps you before you're allowed in. Your photo is then printed on your admission badge. I have no idea what they do with the photo then. Think this will remain an isolated practice for long? I don't. The Irish Data Protection Commissioner recently ruled that biometric entry requirements, where they are clearly posted and marked, are okay for companies to implement. I can see Facebook, Google and every other big tech company soon following Bloomberg's lead. They may even use Apple's Face ID. So stop obsessing about artificial intelligence and machines that are out steal your job. Look, instead, to what tech companies are doing right now.